Posted by Maria Perilli on November 16, 2012. AOV (Average Order Value) Analysis. It’s all about segmenting. AOV values can vary greatly by marketing channel. Segmenting your data will allow you to see just how much clicks from Bing are worth. “Many times I’ve found that a particular channel like Bing can bring in higher average order values or higher conversion rates,” said James Scaggs, author at Search Engine Land. Check Your Budgets. The holidays will undoubtedly bring increased traffic, which can inadvertently cause budgets to cap out on well-performing campaigns. Consider increasing your budgets on campaigns with a solid ROI to avoid missing out on sales. Do you work with PPC campaign management? 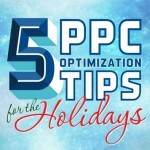 We’d love to hear your tips on maximizing your campaigns for the holidays. Leave a comment and let’s continue the discussion!